On March 19th, Donald Trump met his match – sort of. 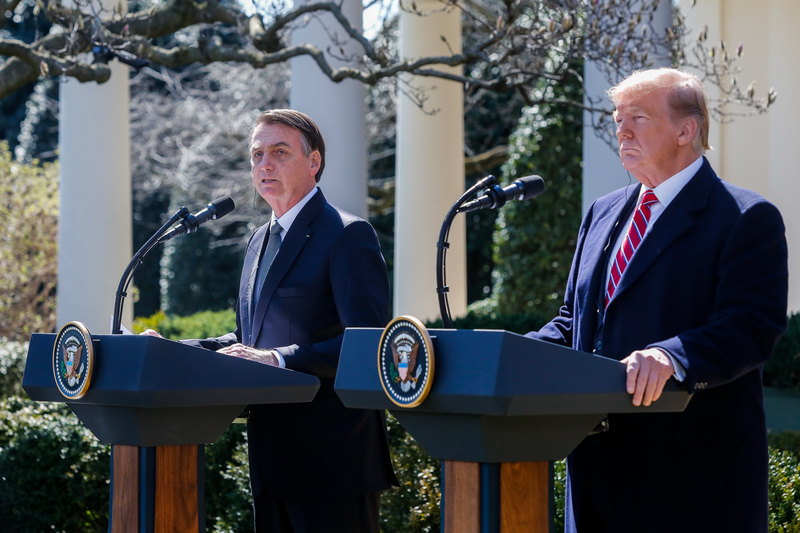 Trump welcomed Brazil’s recently inaugurated right-wing president Jair Bolsonaro, who has been dubbed the “Trump of the Tropics” by various media outlets. The meeting of the two conservative populist leaders symbolized Brazil’s shift away from regional allies towards the US and the global emergence of nationalist anti-immigration sentiments. As Trump and Bolsonaro discussed ways to strengthen military and economic ties, the American president made a statement at the joint news conference during the meeting that raised eyebrows across the world. He declared that he intends to make Brazil a major non-NATO ally or a NATO member. The first part of Trump’s suggestion is sensible. The US government can designate a non-NATO country it wishes to further defence and security ties with a “major non-NATO ally” (MNNA). This status comes with advantages like collaboration on research and development of defence technology, more joint military exercises and training, preferential access to purchasing US military equipment, and increased military coordination. There are currently 17 MNNA nations across the world; the only Latin American one is Argentina, which was declared a MNNA in 1998. While there is definitely a debate to be had about whether Brazil should be designated a MNNA, it is a feasible idea that can become reality – unlike the notion of Brazil becoming a NATO ally. To put it bluntly, Brazil cannot join NATO in the status quo. Article 10 of the Alliance’s founding treaty lays out that member states can unanimously invite only European countries to join. Though Trump didn’t elaborate on his proposal, one could argue that the North Atlantic Treaty isn’t set in stone, since a revision of the agreement could remove geographic barriers. This idea isn’t completely unheard of; various scholars have suggested that NATO should seriously consider welcoming countries outside of the North Atlantic, especially considering that many European countries are struggling to spend the targeted 2% of their GDP on defense. However, revising the treaty and extending membership invitations would be incredibly difficult because these steps would require unanimity. Achieving consensus regarding Brazil would be particularly unlikely. Many of Bolsonaro’s views (e.g. calling for political opponents to be assassinated, admiration for the past brutal military dictatorship, attacks on minority groups) run counter to the Alliance’s commitment to democracy. Furthermore, European members may be reluctant to extend collective defence to Latin America since such a move would be difficult to justify to their citizens compared to furthering stability and security in their own region. Even if the territorial limitation was removed and allies looked favourably upon Brazilian membership, Brazil would be far down the list of potential invitees due to its low defence spending (1.3% of GDP) and lukewarm relations with NATO countries. Australia, New Zealand and Japan could be more preferable due to their history of contributions to NATO efforts and participation in multiple NATO initiatives through established partnerships. Trump’s proposal of making Brazil a NATO ally is concerning for a few reasons. First and most obviously, it raises the question of whether the Commander in Chief of the world’s most powerful military understandswhat the North AtlanticTreaty Organization is. Second and more concerning is the possibility that there is no misunderstanding but rather, an active choice to disregard the Alliance’s European and North American roots. Such a decision disrespects the history and core purposes of NATO in addition to dismissing the founding rules. Moreover, Trump virtually equating MNNA and NATO ally status ignores the multilateral nature of NATO and its decision-making process; the former is a bilateral status that can be designated by the US government while the latter involves a major commitment to security, stability and democracy, and involves reaching consensus among 29 countries. Considered alongside Trump’s more unilateralist foreign policy and constant attacks on NATO, the idea that Brazil could become a NATO ally is not encouraging for the future of global cooperation or US-NATO relations. The good news is that Brazil’s location does not prevent it from working with NATO. The Alliance began to establish partnerships with non-member nations in 1990; today, NATO has regional partnership frameworks (e.g. Euro-Atlantic Partnership Council, the Mediterranean Dialogue) and global partnerships with countries that aren’t part of regional programs. Although the goals and forms of these partnerships are determined on a case-by-case basis, they usually focus on capacity and capability building, joint training exercises, improving transparency in the defence industry, research collaboration, and partaking in NATO-led operations and missions. In May 2017, Colombia became the Alliance’s only Latin American partner, though Bogota has collaborated with NATO on various initiatives since 2013. The new partnership will increase collaboration on cyber and maritime security, organized crime, and improving the capabilities of the Colombian armed forces, while NATO will also benefit from Colombia’s expertise in demining and counternarcotics. It does not appear that a partnership with Brazil is in the cards just yet. There are certainly arguments in favour of establishing such a relationship; Brazil is one of the world’s largest economies and NATO further extending its reach in Latin America could be helpful if the situation in Venezuela deteriorates. That being said, NATO and Brazil don’t have a history of extensive cooperation or partnership talks. In short, Trump can designate Brazil a MNNA but cannot make it a NATO member. While his proposition that he may be able to do so is both confusing and disappointing, it should serve as a reminder that NATO remains an impressive example of multilateral decision making and cannot be controlled by a single president or a single country. NATO is a groundbreaking cornerstone of Euro-Atlantic security that is able to establish productive partnerships with non-member countries across the world. Featured Image: Bolsonaro with US President Donald Trump in White House. Via Wikimedia.com.